The Times published an article this week, which questioned whether a wikileak report gave the pretext for the regime to implicate Jamali Fashi in Prof. Ali-Mohamadi's assassination. This post is not about the wikileaks report, I never managed to find out who the martial arts instructor in the wikileaks report was, but I was the one who after watching Jamali Fashi's confessions on state TV, found out he had been representing the Islamic Republic in a kick-boxing tournament in Australia and I have always suspected the regime's own involvement in the assassination of scientists since 2010. Question 1) Does Jamali Fashi's demeanour in this video suggest this is a man few minutes before his execution? He comes across composed and articulated. At one point the camera even focuses on his hands and they are not trembling a bit. Once again his statements contradict his other statements in this video and his previous recants shown on television as to when and where he first made contact with the Israelis. He suggests that he was duped by the Israelis into thinking that by killing the Iranian scientists, he will 'save the world'. A motivation that just doesn't become his portrayed greed for money. Question 2) Where are the other 9? At the time of his arrest and first TV confession, it was suggested that he was arrested as part of a ten man network. Two years on, nothing has been said or heard about the other nine. Where are they? Question 3) Is that Jamali Fashi in the picture of a hanged man? 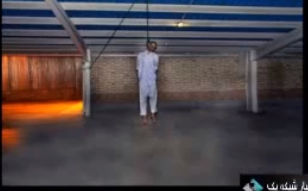 The only picture of Jamali Fashi's execution which is shown in the video above is blurred and from a distant and it can not be verified that its him. Given that the regime is not known for its regard for public sensitivity in seeing pictures of the dead and morbid images, why is it that in this instance they have chosen not to show his pictures? 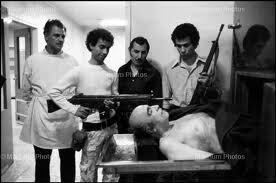 A practice which they have been quite comfortable with in the past, ever since publishing pictures of the executed regime officials of the Shah.